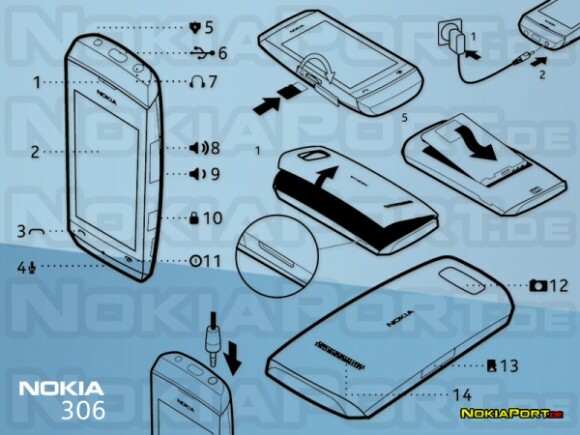 A graphic, taken from the manual of a prototype has leaked out, showing us the touch screen sporting, Nokia 306. Curiously enough however, there is no information on the OS, which the upcoming Nokia will be running. The device could be running a Symbian version, due to its support for multiple home screens, along with a status menu, located at the top of the screen. On the other hand, the two button configuration below the display, and its resolution of 240x412 pixels point into an updated S40. So does the name of the device, which strongly suggests that the Nokia 306 belongs to the Asha family. The leaked specs of the Nokia 306 include Bluetooth, Wi-Fi (b/g), MicroSD card slot, Micro USB port, FM Radio, and AV Out. The battery is Nokia BL-4U with a 1100mAh capacity. coming out from the graveyards?